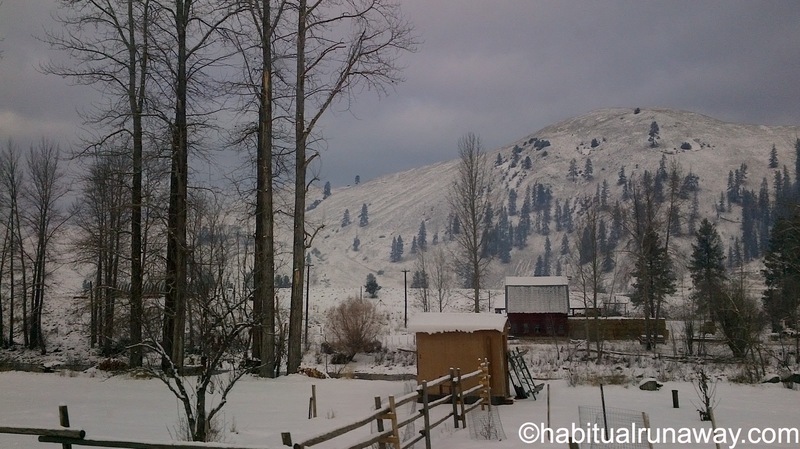 Over the holidays we decided to visit family in the British Columbian interior. 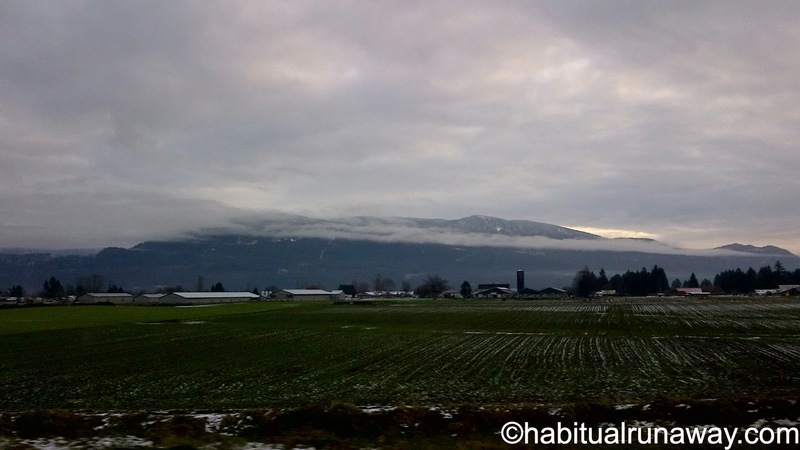 Our tour would start out on the Trans Canada highway, known as HWY 1, and would continue up to the Crowsnest highway 3, past Hope (or ‘beyond Hope’, as the local joke goes), and through the Cascade mountain range. 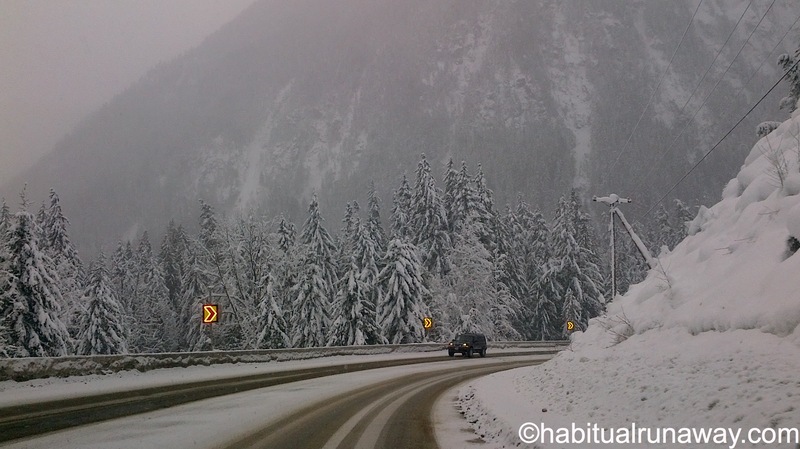 We try not to do a lot of driving through the mountains in the winter for the obvious reasons. We don’t have a ‘real truck’, but a low riding city pickup not even made for potholes, let alone mountain passes, but we were going to head into the wilderness, regardless. We like to do our best to be prepared, just in case, so we bought some chains for our recently switched out winter tires and packed snacks and warm clothes. Having been stuck in the wilderness before (a story for later, perhaps), I am not interested in being under-prepared when it comes to winter conditions. I prefer NOT to test my luck when I could freeze to death in a few short breaths. 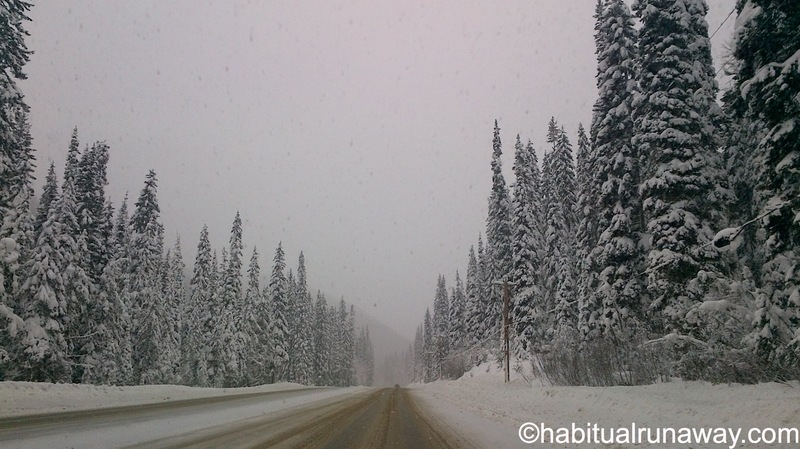 After all, this is the area where the Canadian TV show ‘Highway Thru Hell‘ is filmed, and if you have ever seen it – even once – you know the dangers of the snowy mountain roadways. 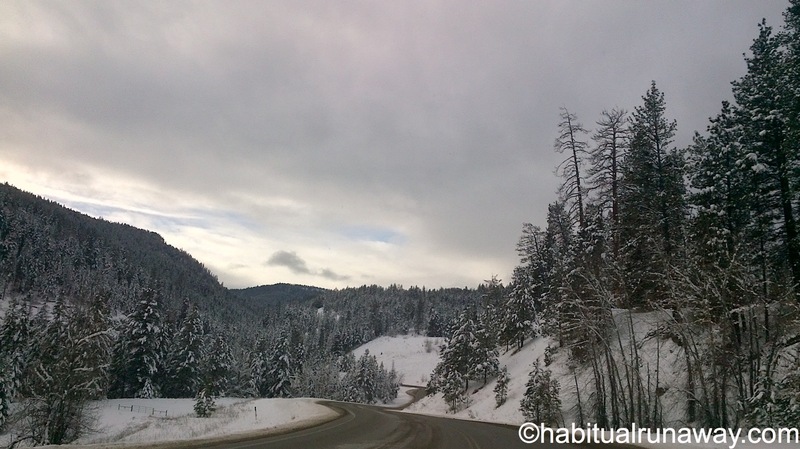 Scary driving – avalanche routes, cliffs, sharp corners and snow covered signs. At times we barely drove 35km an hour! The climate in the lower mainland of British Columbia Canada, where we live, is always tempered by the ocean and winds re-directed by the mountains. It is relatively warm where we are, and if it snows (which it rarely does), the thin white layer generally lasts no more than a few hours. The grass is always green, many trees keep their foliage – some turn for Autumn, and though you might want rain gear, you won’t need a winter coat – unless you like skiing in the mountains. It is always surprising to me how quickly the climate changes here – just a twist in the road can bring you somewhere entirely climatically different. 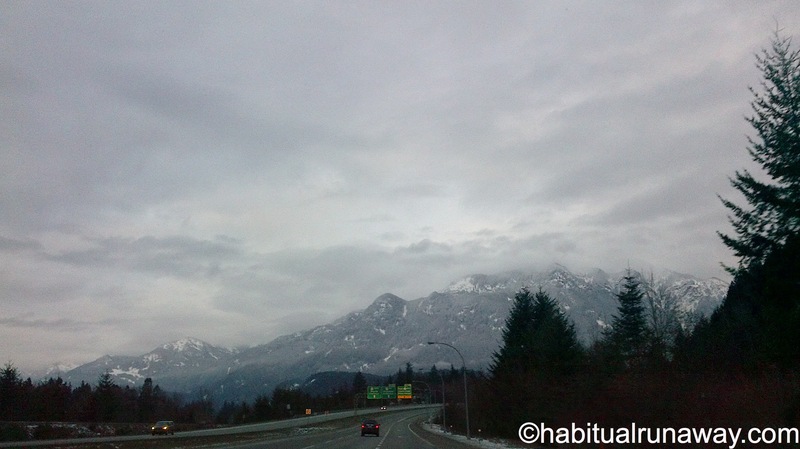 We go through the Fraser Valley, round up to the mountain encircled town of Hope and already the snow is setting in. My favourite example of dramatic climate change lies between Princeton and Hedley. Though the towns are barely 20 minutes apart, Princeton is often degrees colder and certainly snowier than its neighbour. Hedley was actually warm, sun blazing (blinding, more accurately! ), snow predominantly melted. You can physically see the changes start once around the mountain bend. Weather patterns, fascinating! We made it to and from our destination without incident, and though we enjoyed a white Christmas, it was nice to get back home to the warmth and the green grass – where our little dogs don’t need winter coats! Jack & Jim – ready for winter! You can click the photo of Jack and Jim above to view article photos in full size. Many (many!) additional photos in the slideshow. Photos taken with my new Blackberry Playbook Christmas present! Enjoy many more photos at the Habitual Runaway on Facebook. We’ve been over Crowsnest Pass a few times…but only in the summer! Enjoyed the photos and seeing what it looks like at this time of year. Oh thanks – it is gorgeous in the winter – but definitely safer in the summer! I saw your photos on Facebook – gorgeous. It’s really a winter wonderland! Lovely photos with your V.V.Nice . Christmas Present !! Belated Merry Christmas and a happy New Year to you. Oh how thoughtful! =D I will head over and take a look – thank you! Yeah, Crowsnest pass – scary spot, I lived there a while. Thanks for stopping by La Maison! I remember driving through the Canadian Rockies during a snow storm. It is quite spectacular! Great blog! Have driven these roads often; too often, I sometimes thought at the time. In winter. Very prudent to take the preparations you do. Never know. And one knows quickly when never seems to be in the offing. Thank you! 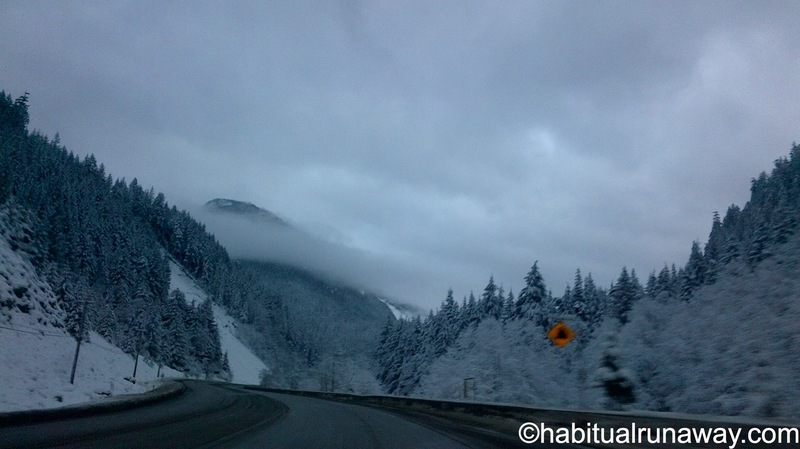 Yes, you would be able to relate – it really is treacherous – things can go awry in seconds…we too try to avoid snowy mountain driving! Oh thank you, thats so kind =). I actually have another blog at spiritualanalog.wordpress.com, that I use the photos I take to turn into inspirational quotes. I have more than 300 now waiting in que to be ‘spiritualized’. I am afraid that might conflict with your idea for usage, no? Feel free to take a look and see what you think =). Thanks again for the lovely compliment! They do look cute in their coats though. Glad it all worked out and nice photos. You have some lovely winter photos here. 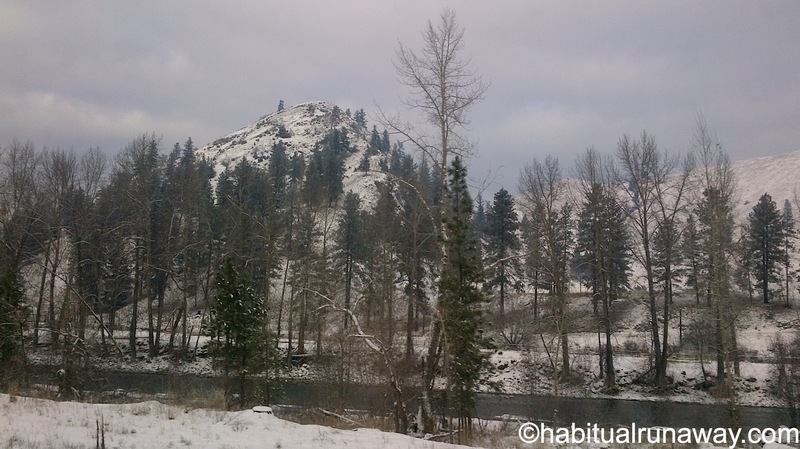 Great photos…reminded me of crossing the mountain passes in January ’82…Idaho, Montana…chains, passes closed, but this was in the States and so more traffic, but we were driving a crappy U-haul truck with all our stuff. Adventures…with dogs. We drive the mountain passes often and we are amazed, as you mentioned, how quickly the weather changes and how bad it can get. Great pictures. I love Canada! Thank you for stopping by my blog, it is much appreciated. Great photos. I love Jack and Jim. Sigh…I miss the mountains. Wish I could get out west more often. Oh yes, I never get sick of the mountains! 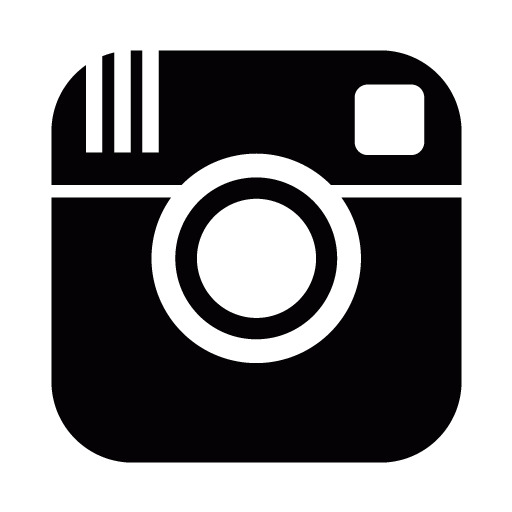 You are welcome, your photos are fantastic :). Thanks for stopping by the new website, Ana!